Sqwincher 2-1/2 Gallon Powder Pack Concentrate is perfect when needed for larger groups and can be mixed in the Sqwincher 3 Gallon Cooler easily where the extra 1/2 gallon of cooler space is made for additional ice. There are 32 packets to a case which yields 80 gallons. Sqwincher is more satisfying than water or soft drinks because the body absorbs it more quickly and restores it to its proper electrolyte and fluid balance. By providing your workers with the proper hydration they need, their performance levels will be enhanced. 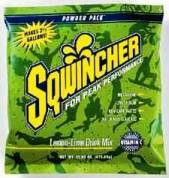 Sqwincher 2-1/2 Gallon Powder Packs are available in a variety of flavors including Lemonade, Orange, Fruit Punch, Lemon-Lime, Grape, Cherry, Tropical Cooler, Tea, Mixed Berry and Cool Citrus. There is also an assorted flavor cases available with a mix of Orange, Grape, Lemon Lime and Fruit Punch. You may also purchase in 5 Gallon Powder Packs and 1 Gallon Packs.